How many times have you been really excited about something and it turned out to be just okay? Well, I have to say that is what happened to me this weekend. My mom, my brother, and I all went out for brunch on Sunday. We were excited to go to The Vegan Joint but it wasn’t the experience I was hoping for. There are some positives and some negatives so I feel like I should tell you both. 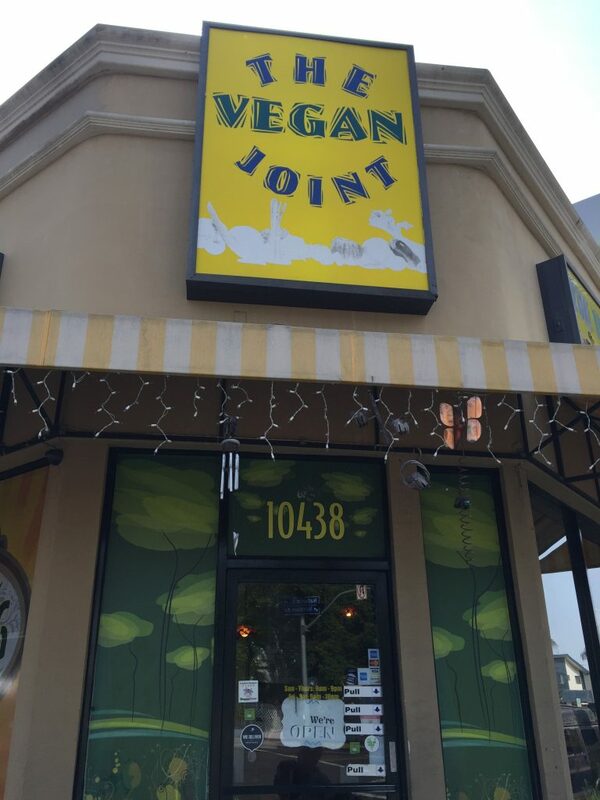 The Vegan Joint is in West LA on National Boulevard. When we first walked in we saw that it was a pretty small restaurant but it had a lot of tables near the windows. There was no one else in the restaurant except us, which is good, because I thought that would mean we would get our food quicker. On the good side, the whole place is vegan so, if you are, you have a whole menu to choose from without worrying about anything. And there were also some choices for gluten free eaters. They had breakfast burritos and make your own omelet that was made out of tofu! I wonder how they did that. Unfortunately the way they make the omelet somehow mixes gluten in with the tofu so that one was off the list for me and my mom who had been interested in ordering that. The breakfast burritos they can accommodate gluten free by using corn tortillas. Both me and my brother ordered burrito #1 that had soy bacon bits, tofu scramble, and vegan cheese. I also split a big hash brown with my brother. When the food came, I was excited about how big the portion was. But in the end, overall, I have to say, I was disappointed. 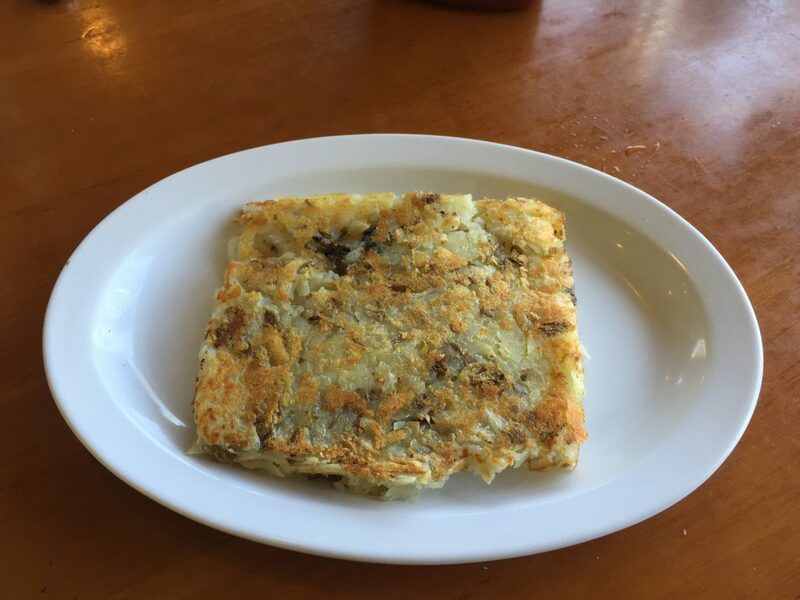 The hash browns were amazing and I have to tell you that because if you are a hash brown person maybe you want to come here just for that. 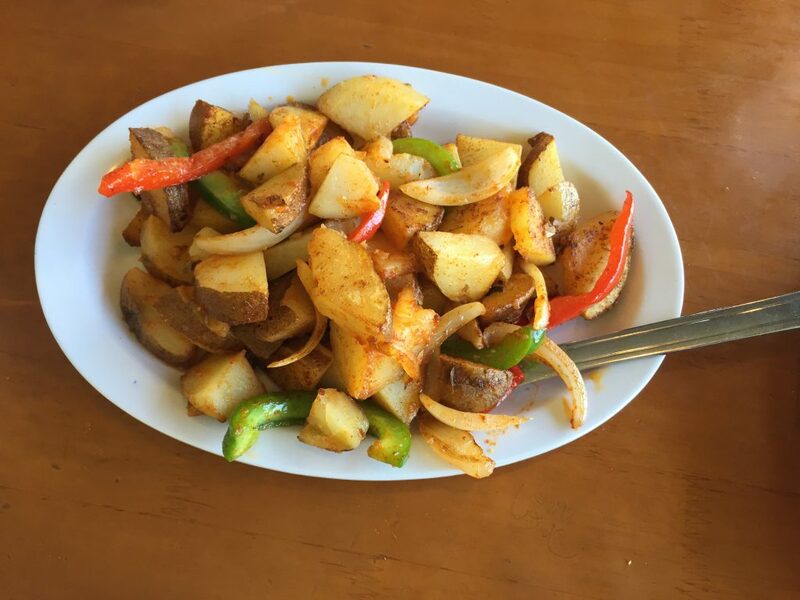 Really, if you’re craving great potatoes, you should definitely come here. 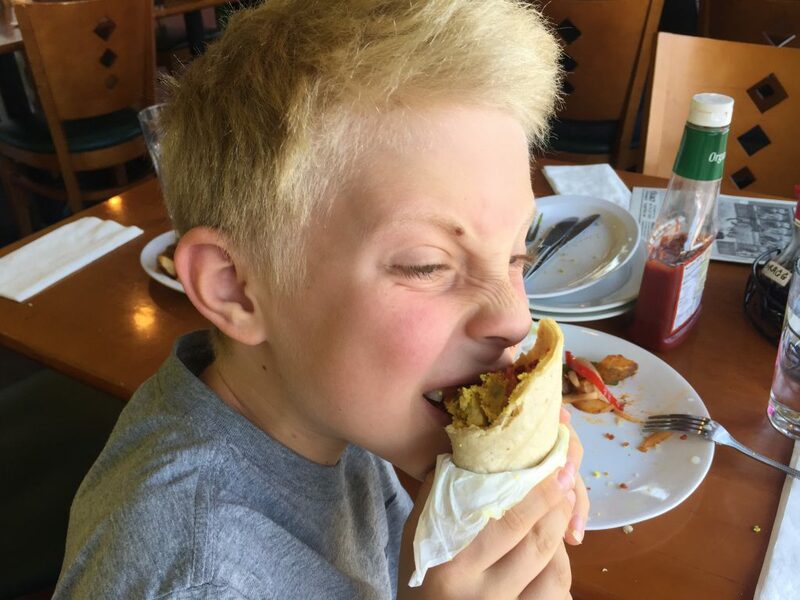 But the burrito, which was the main feature, was pretty bland and plain. 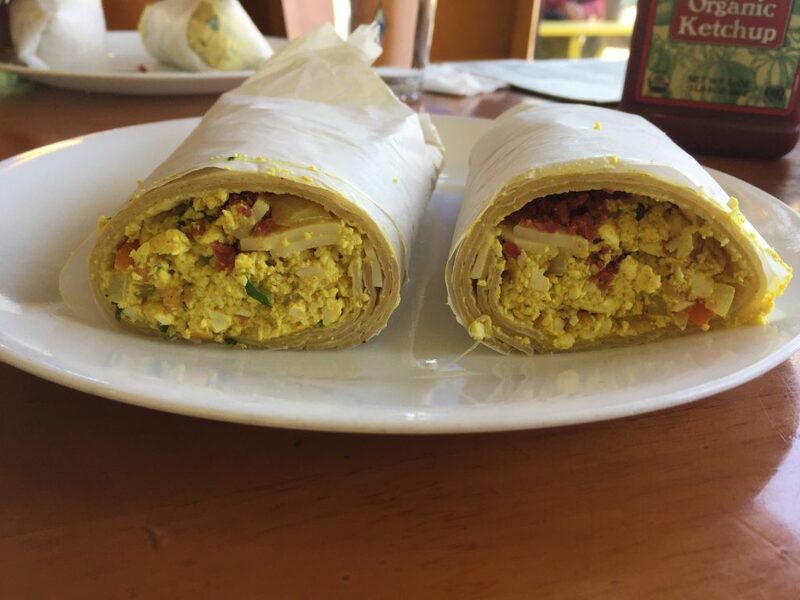 It was just a tortilla with tofu scramble and cheese. It lacked flavor. If they had added a little salsa or a red sauce, then at least the dish would have had some balance to it. And it was really crumbly. I usually eat a ton of food and I didn’t even eat half my burrito. That should give you an idea. Here’s me eating my burrito but I didn’t even get through the whole thing. Also, they messed up my mom’s order, too, and she had to send it back but it just took too long and she ended up eating mine instead of waiting for hers. She wasn’t a huge fan of it either. Although she did order a side of breakfast potatoes and she liked those. And me and my brother ate most of them. So, again, this place has potatoes down well but for me it didn’t make up for the rest. Service also matters and the waitress was not really that friendly so it is hard to see coming back here. I think the thing that I’d consider is if I was in the neighborhood and wanted a snack. Maybe I’d just order a hash brown. I know this isn’t a rave review but I’m trying to be balanced in telling the truth of what the experience was like. Tags:breakfast burritoburritohash brownspotatoesvegan jointwest l.a.